The only full-body photograph of Neil Armstrong on the moon shows him working at the Apollo 11 lunar module "Eagle" on July 20, 1969. The first man to set foot on the lunar surface was inadvertently captured on film by Buzz Aldrin, who was tasked with taking a series of panoramic photos. Late astronaut Neil Armstrong's historic 1969 moonwalk put dreams of spaceflight in the heads of countless kids around the world — including one Canadian nine-year-old who would grow up to become his nation's first International Space Station commander. Chris Hadfield is slated to assume control of the huge orbiting laboratory in March 2013, something no Canadian has ever done. And he said watching Armstrong — who was memorialized in a public ceremony today (Sept. 13) in Washington, D.C. — take that famous "one small step" inspired him to work toward becoming an astronaut, despite some pretty steep odds. "When I was a kid, it was impossible to be an astronaut. It wasn't just hard — it was impossible. There was no Canadian astronaut program," Hadfield told SPACE.com. Canadian Space Agency Astronaut Chris Hadfield. "But I thought, as a nine-year-old Canadian kid, 'Well, shoot. 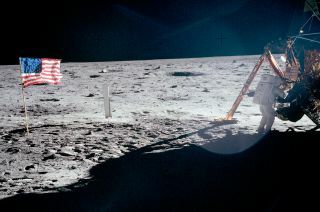 We just landed on the moon for the first time, and nobody ever did that before,'" Hadfield added. "'So maybe things will change, and even though it's impossible now, I'm going to start getting ready.'" Hadfield is scheduled to launch toward the station aboard a Russian Soyuz spacecraft on Dec. 5. He and two fellow spaceflyers — NASA astronaut Tom Marshburn and Russian cosmonaut Roman Romanenko — will round out the orbiting lab's six-person Expedition 34 when they get there. NASA astronaut Kevin Ford will command Expedition 34. But Hadfield will take charge of Expedition 35, which begins when Ford and Russian cosmonauts Oleg Novitskiy and Evgeny Tarelkin depart the station in March. Hadfield has spent a total of 20 days in space on two space shuttle missions — STS-74 in 1995, which helped build Russia's Mir space station, and STS-100 in 2001, an International Space Station assembly flight. He said he's thrilled that he'll get to live on orbit for a five-month stretch this time around, and honored to be selected as commander. "It is hugely exciting and a great honor to be asked to be the commander of the International Space Station," Hadfield said today during a press briefing to preview Expeditions 34 and 35. "It's just a dream come true." Neil Armstrong vaulted to icon status on July 20, 1969, when he became the first person ever to set foot on another world. The words he uttered upon stepping onto the moon — "That's one small step for [a] man, one giant leap for mankind," are among the most famous ever spoken. Armstrong died Aug. 25 following complications from a recent heart surgery. He was memorialized first in a private ceremony in Cincinnati on Aug. 31, then in a public service today at Washington National Cathedral. The former Navy pilot is scheduled to be buried at sea Friday (Sept. 14).